Carl Jacob Früauf (Fruehauf or Friauf) was born in Norka, Russia on October 5, 1849, the son of Carl Gustav Reinhold Früauf (born September 8, 1811) and Maria Schlitt (born June 18, 1814). Carl married Catharina Schwindt before 1875. Catharina was born January 22, 1851 in Norka, the daughter of David Schwindt and Magdalena Schmer who were also early settlers in Portland. Carl and Catharina had five children who were born in Russia: Katharina (1875-1967), Charles F. (1878-1911), Pauline (1880-1951), Alexander John (1883-1941) and Lydia (1885-1937). The family immigrated to the United States in 1888 they were living in Portland by 1891. A son, Richard H., was born in Portland on December 16, 1891 (he died in 1956). In 1910, the family was living at 406 Graham Avenue and Carl was working as a machinist for a steam railroad company. Their son, Charles was married and living next door. Charles worked as a bartender in a saloon. Catharina died on April 12, 1915 in Portland and was buried at the River View Cemetery. In 1920 and 1930, Carl continued to reside at 406 Graham Avenue, with his children Alexander and Lydia. Carl died on March 7, 1934 and was buried with Catharina at the River View Cemetery. 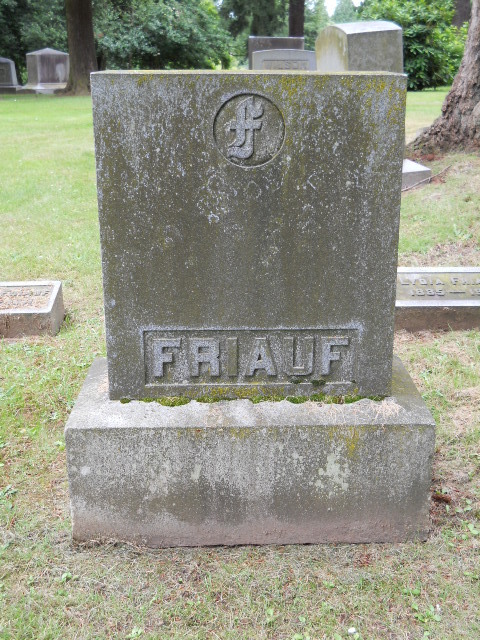 The Friauf family burial site at River View Cemetery in Portland. Last updated January 23, 2016.